The only comfort we have is in knowing that before Gary died, he made peace with God, and left us to go be with Him. He did not leave us a note but left us the gift of knowing without a doubt that he is in heaven waiting for us. I have decided to give my life to Jesus. I was at ground 0 I got on my knees and begged God for forgiveness and to help me-He will to because that’s all he wants is for you to ask him for forgiveness and ask Jesus to come into your heart. He died for you. If you were the only one on earth He would have still died to prevent you from going to hell. …as much as I talk and tell you about God, it’s never gonna do any good. You have to want to change sincerely in your heart all can be forgiven that’s why God gave His only son to die for you-we are born in to sin and He knew that you would need Him-all you have to do is swallow your pride, admit that you are a sinner against God-ask for forgiveness, ask Jesus to come into your heart with sincerity and start to live a new life through Christ. It’s not an overnight thing though-all your problems aren’t going to just go out the window, but the devil has no power over you when your God’s child. I appreciate all your effort to try and get me on track. I know it’s been “grueling” but hopefully things will work out and I’ll be able to take care of everyone who took care of me. I love you all and think it was good that I came to stay with you, so we could better our relationships. I’ll miss ya. Wish me the best with my crazy career choice. I think it was meant to be. God never wastes a hurt. 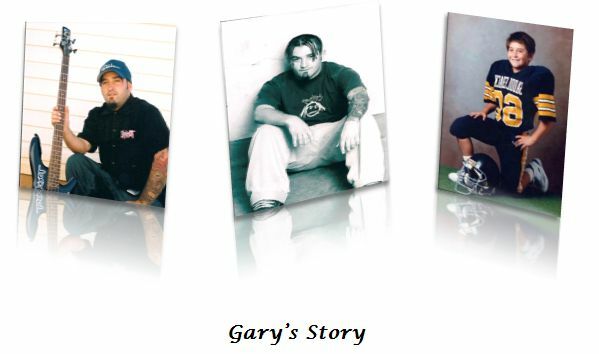 Our hope is to help others by sharing our story, keeping Gary’s memory alive through Good Works in his loving memory.